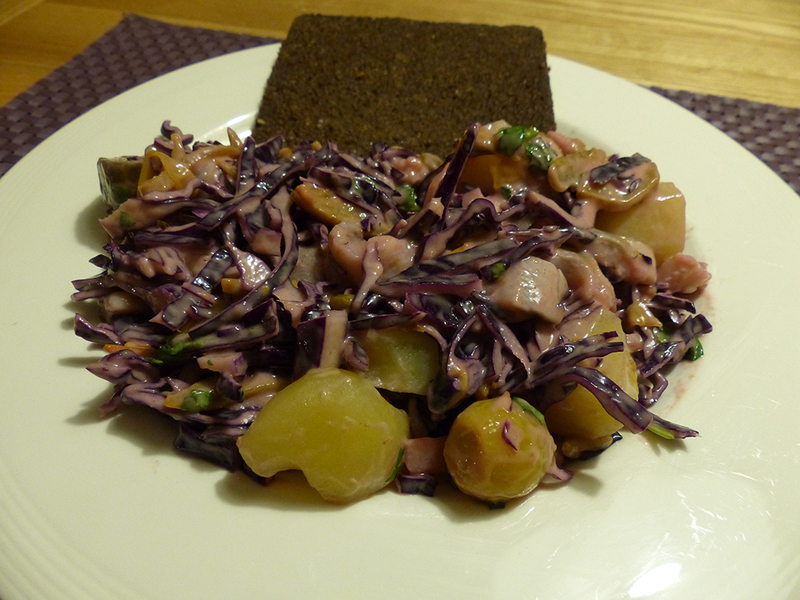 This is a very easy-to-make seasonal recipe using red cabbage (homemade) piccalilli and healthy pickled herring. Most mayonnaise is dairy free, but if allergic, please check the ingredients! Cut the potatoes in quarters and boil them until they are soft. This normally takes around 15 - 20 minutes, depending on the type of potato and the size of the parts. You can check it's cooked by pricking a fork in a potato and if it goes in easily they are ready. In a large bowl, mix together the piccalilli with the mayonnaise. The rest is very simple, just thinly slice the red cabbage (you can use a kitchen machine for this), slice the marinated herring and its onions, chop the coriander and add this to the bowl. Mix well. And add the potatoes when they are done too. Mix everything together and serve with 2 slices of pumpernickel bread.